The Earthquake and Tsunami of 17 October 1966 in Peru. The Earthquake: A strong earthquake of 7.5 magnitude on the Richter scale occurred east of the Peru Trench axis at 21:42 (Greenwich Time) on October 17, 1966. The epicenter of this quake was at 10.7 S Latitude and 78.7 W Longitude off the coast of Pativilca of Central Peru, 190 Km northwest of Lima (U. S. C & GS, 1966.) Its focal depth was 60 Km . Earthquake Effects: The earthquake affected a coastal belt 400 Km long and less than 50 Km wide, and severely damaged the towns of Huacho, Huaura, Puente Piedra and sectors of Lima-Callao. The highest intensity was observed in the vicinity of Huaura and may be related to a fault between Upper Jurassic and Lower Cretaceous sediments. (Lommitz and Cabre', 1968.) Effects of high intensity were also observed near the outlets of rivers and other areas of recent alluvium deposits. The tsunami: The quake generated a large tsunami which caused destruction along the Peruvian coast from Chimbote in the North to San Juan in the South. (Pararas-Carayannis, 1968). The greatest wave at Callao had a range of 3.40 m height (range between maximum crest and trough) and tsunami waves exceeding 3 meters in amplitude (height above undisturbed water level) inundated La Punta, Chuito, Ancon, Huaura, Huacho, and the resort of Buenos Aires in the City of Trujillo. Tsunami Effects in the Immediate Area: Within 60-70 minutes after the quake, tsunami waves arrived at the cities of Chimbote and San Juan, which are about 800 Km apart. Devastating effects were experienced at Casma and Calota Tortuga where waves exceeding 6 meters in range destroyed many structures. (Pararas-Carayannis, 1968). The port of Casma, about 360 Km north of Lima, suffered the greatest damage. Losses were estimated at about $4 million (40 million Soles). Many fish-flour factories and the harbor wharf were severely damaged. 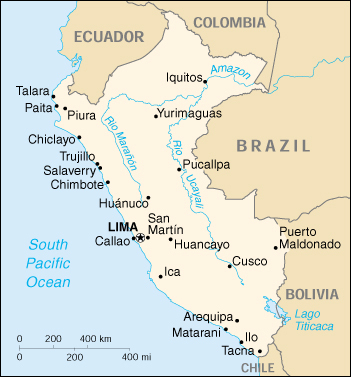 Tsunami destruction also occurred at Puerto Chimu and Culebras (El Commercio de Lima, Peru, 18, 19 October 1966). The tsunami caused no damage outside Peru, but was recorded by tide gauges throughout the Pacific Ocean. (Beckman and Carrier, 1967). The Peru-Chile Trench - also known as the Atacama Trench - is the active boundary of collision of the Nazca Plate with the South American Plate. Subduction of the Nazca plate beneath the South America continent is not homogeneous. As a resut , asperities and structural complications have caused segmentation along the entire margin, resulting in zones with different rates of slip, seismic activity, volcanism, uplift, terracing and orogenic processess. Different sections of the margin along the Great Peru-Chile Trench, are segmented by great fractures. Each segment has its own characteristic parameters of collision and structural geometry and, thus, different potential for large earthquakes and destructive tsunamis. The structure of the subducting oceanic Nazca plate is complex (Pedoja et al. 2003). According to Le Pichon et al. (1973), the velocity of subduction of the Nazca plate near the south Chile and north Peru region is about 8.7 - 8.8 cm/y. The historical record supports that the rate of subduction is not uniform and there is significant fragmentation along the entire length of the margin as well as differential uplift of the continental block. Certain tectonic block segments along the Peru-Chile tectonic boundary have the capability to generate very large earthquakes. In recent times, large earthquakes in regions of high rate of subduction have resulted in uplifting and terracing sections of the South American coast by as much as a few meters. Marine terraces and evidence of tectonic segmentation is also evident along the entire North Peruvian and Ecuadorian active margin. The ongoing process is responsible for the active orogenesis that is taking place and has created the young Andean mountain range. The region (from 7.5 to 12.5 degrees South latitude) has produced at least seven destructive earthquakes in the vicinity of Chimbote and Lima-Callao. These occurred on: 9 July 1586; 13 November 1655; 20 October 1687; 28 October 1746; 30 March 1828; 24 May 1940 (M = 8.4); and 17 October 1966 (M = 7.5) (Pararas-Carayannis, 1974). Of these, the earthquakes of 1586, 1687, 1746, 1828 and 1966 are documented to have produced destructive tsunamis (lida el al., 1968, Pararas-Carayannis, 1974). 1687, 10 20 - 9 30 Reconstructed Epicenter 13.50 South, 76.50 West, Magnitude 8.5 3.5 1.0 8.00 14 M 5000 T 4 SAM LOC Off Callao. At Callao and Chancai Pisco, the sea retreated then returned with great violonce. Town and market were destroyed. No other details. Earthquake Energy Release: The 1966 earthquake occurred along one of three distinct seismic zones in the Peruvian upper mantle (Ocola, 1966, Pararas-Carayannis, 1974). The activity of this zone is most pronounced on the western side, and lies between the Andean mountain block and the Peru-Chile Trench. This narrow seismic band (100 to 150 km wide) is under Peru's Continental Shelf and is characterized by shallow earthquake activity and has great tsunamigenic potential (Pararas-Carayannis, 1968, 1974). Fig. 1 Energy release earthquakes off Central Peru for the period 1949 - July 1963. (Modified after Ocola, 1966). E, epicenter of earthquake of October 17, 1966. The seismicity of this particular region can be expressed taking into account , not only the number of recorded past events but also their size, frequency, and spatial distribution (Pararas-Carayannis, 1974). For example, Ocola (1966) processed all earthquakes which occurred in the area during a 14 1/2-year period and prepared an earthquake energy release map which illustrates quite well the seismicity of this particular region. This map was prepared using the empirical relationships of earthquake energy, magnitude, and frequency, derived by Gutenberg and Richter (1956), by plotting the energy release of equivalent earthquakes of magnitude 4 (Richter scale). 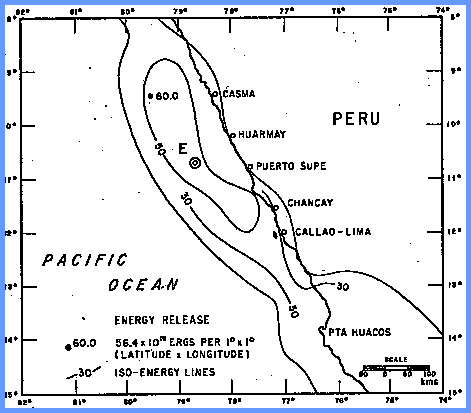 The figure provided here is a section from Ocola's map showing the earthquake energy release off the coast of central Peru from January 1949 to July 1963. The energy density contours are in units of 10 raised to the 19th power of ergs per 1 degree of latitude by 1 degree of longitude, for the 14 1/2-year period. The 1966 earthquake occurred within the band of highest activity shown in this figure. Although this map was prepared more than 40 years ago, and for a relatively short time interval, earthquake events which have occurred since - including the February 21, 1996 event - do not show significant change in the seismicity pattern in this region of Central and Northern Peru. The orientation of the contours of energy release indicate general trends striking N30W, and are in agreement with the general trend of the fault systems, the Andean Mountains, and the alignment of the Peru-Chile trench in this Central and Northern region of Peru. Specifically, the Peru-Chile trench in this region is oriented at about N30W and the northern part of the Andean Mountains are oriented at about N32W. Similarly, major outcrops of intrusive rocks along the coast have general orientations at N20W and N55W. Fault System Orientation: The 1966 earthquake occurred within the band of highest activity shown in this figure. The orientation of the contours indicate general trends striking N 30 W', and are in agreement with the general trend of the fault systems, the Andean Mountains, and the Peru -Chile Trench. The Peru-Chile Trench in this region is oriented at about N 30 W, and the northern part of the Andean Mountains are oriented at about N 32 W. Similarly, major outcrops of intrusive rocks along the coast have general orientations at N 20 W and N 55 W.
Fault and Azimuthal Orientation of the Tsunamigenic Area. Whether the azimuthal orientation of the fault system and of the seismotectonic block responsible for the tsunamigenic earthquake of October 17, 1966 is indeed parallel to the coast and to the Peru-Chile Trench, can be examined in another way. The nature of the first seismic motion related to an earthquake depends on the crustal displacement of the source. A pattern of compressions and rarefactions can be considered a function of the azimuth to be expected from a seismic source. According to a method developed by Byerly (1955), modal planes of the focus could be deduced from such recordings of compressions and rarefactions. According to Nakano (1923), a single force would send compression waves into a half space and rarefaction waves into the other half space; a couple would send alternate compressions and rarefactions into quarter spaces. It has been established by Galitzin (1909) that the impulse of P waves indicates a vibration in a plane containing the great circle that passes through the epicenter and the station. If the first impulse on the vertical component of seismograph is up, the first phase of P wave is a compression, so the composition of north-south and east-west is in a direction away from the epicenter. A composition of the three components gives the direction of the first displacement of the ground, which however is not the exact direction of the path of the incident wave. It is rather the combination of the amplitudes of the incident P wave and the reflected P and S waves that gives an indication of the motion of the surface of the ground. A projected single straight line on the map, therefore, indicating the fault, should separate regions where the first motion was compression from those where it was a rarefaction, and the strike of the fault and orientation of the tsunamigenic area can be determined. 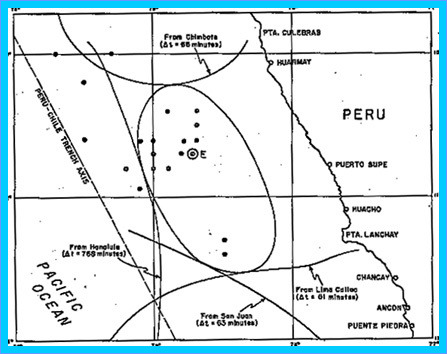 The fact that all the stations in South America, on the continent side of the epicenter reported an initial compression in their seismographs from the October 17, 1966 earthquake, indicates that crustal displacements were indeed along a thrust fault approximately paralleling the Peruvian coast and that the uplifted position was on the continental side of the rift. Lomnitz and Cabre' (1968), probably because of the sparcity of seismic data, were unable to determine a focal plane solution for this earthquake, and could not confirm this parallelism of the fault to the coast. However, the nature of first water motion observed at stations near the epicenter and consideration of the tsunami travel path, as supported by wave refraction in this study, in addition to the seismic evidence, support the conclusion of a fault orientation paralleling the coast. Statistical relationships between maximum crustal displacement and earthquake magnitude M have been compiled, and working curves have been plotted by Wilson (1964, 1969). Although such empirically derived curves display some scatter of data, possibly because of differences in the focal depth and geology of each region associated with each seismic event, a median value can be selected as being reasonable for shallow focus tsunamigenic earthquakes. Vertical Crustal Displacement responsible for most of tsunami Energy: For the October 17, 1966 (M = 7.5), the median value of crustal displacement along the fault taken from such curve is = 4m. If we assume an extreme ratio of Strike-slip: Dip-slip of 10:3, then dip-slip, or vertical movement of the ocean floor along the fault, is calculated from the equation above to be, Z = 1.15m. Vertical displacements of the seismotectonic block responsible for tsunami generation will decay exponentially with distance normal to the fault in accordance to the elastic rebound theory of Reid (1910). The ocean area affected by such displacements, the tsunami generating area, is an ellipse in which the fault occupies the major axis. The leading tsunami waves are generated from the periphery of this area and their arrival at nearby stations is indicative of the initial ocean floor displacement. Maximum runup on the shore, is generally caused by the crest of the tsunami wave near the fault. Based on the above assumptions of vertical ocean floor displacements, the initial tsunami height in the generating area is estimated at a maximum of 1 - 1.1 meters above the undisturbed sea level. Shoaling and Coastal Effects on Tsunami Amplification: Considering that the waves reaching the immediate coastline had amplitudes of about 3 meters, the shoaling and resonance amplification factor on the coast for local tsunamis, for these particular localities, is estimated to be three times the deep water value. Given, therefore, the magnitude, depth, and epicenter of an earthquake offshore, and utilizing the assumptions and empirical relationships outlined here, the runup along Central Peru from tsunamis originating from Peru's seismic region 4 can be roughly approximated. and for a magnitude of 7.5, a fault length of 118.85 kms is calculated for the October 17, 1966 earthquake. This estimate is in good agreement with the results of this study. The tsunami generating area of the October 17, 1966 earthquake was determined by an indirect reverse wave refraction method, refracting waves from Chimbote, Lima-Callao, San Juan, and Honolulu. (Fig. 2). According to this method, the arrival time of the first tsunami wave at each of these stations was obtained from the tide gauge record, and its total travel time was determined. Tsunami Wave Refraction: Waves were refracted toward the earthquake area from each station for lengths of time equal to the tsunami travel time for that station, using the long wave velocity approximation c = Square root of (gd) , where c is velocity, g is gravity, and d is depth. The last wave front from each refraction diagram ( Figure 1) should correspond to a point on the boundary of the generating area. An ellipse tangent to these wave fronts was drawn approximating the tsunami-generating area. Since no tsunami travel times were available for the coastal towns near the earthquake epicenter, the shore ward boundary of the area was approximated based on the symmetry of the ellipse. = 1/6(1.03)(.980)(10 raised to 3)(10 raised to 4)(.55 raised to 2)( 13,000 sq. km)= 6.8 x 10 (raised to the 19) ergs. 1 erg = g cm(raised to 2) sec (raised to - 2). Considering that the energy of the October 17, 1966 earthquake was 1.122 x10 (raised to 23) ergs, the energy responsible for the tsunami generation is about 1/1,650 of that value. a. The earthquake occurred in the western part of an active seismic belt that lies between the Andean mountain block and the Peru-Chile Trench. This seismic region has been responsible for a number of earthquakes within recorded history. b. The energy of the main ear earthquake was estimated to be 1.12 2 x 10 (raised to 23 rd power) ergs. The energy of the aftershocks was estimated to be 2.357 x 10 (raised to the 20 th power) ergs. c. The spatial distribution of aftershocks associated with the main earthquake correlated well with known seismotectonic trends and the seismic velocity structure anomalies which are characteristic of thrust fault systems at continent-ocean boundaries. Potential tsunamigenic areas can therefore be identified by such methods. d. The fault and azimuthal orientation of the tsunamigenic area were aligned with crustal displacements along a thrust fault which paralleled the Peruvian coast. Seismic and water motion data indicated that the uplifted portion of the crustal block was on the continental side of the rift. The earthquake fault is a seaward extension of a fault system which has a pronounced surface expression in the Tertiary formations of an area near Ancon. e. The tsunami was generated by displacements of a crustal block with a total area of 13,000 sq. km. Its energy was calculated to be 6.8 x 10 (raised to the 19 power) ergs, or 1/1,650 of the earthquake energy. Ambraseys, N. N. and Zatopek, A. (1968); "The Vazto Ustrikran (Anatolia) Earthquake of 19 August 1966", Bulletin Seismological Soc. Am., V. 58 (1), Feb., pp. 47-102. Berckman, C. S. and Carrier, D. D. (1967); "The Tsunami of October 17, 1966, as Recorded by Tide Gages". Tides Branch, U. S. Coast and Geodetic Survey Informal Pamphlet, 8 March. Byerly, P. (1955); "Nature of Faulting as Deduced from Seismograms", Geol. Soc. Am. Spec. Paper 62, 75-86. Furumoto, A. (1972); "The Great Alaska Earthquake of 1964 - Source Mechanism Study by Raleigh Wave Analysis", National Academy of Sciences, Committee on the Alaska Earthquake, Volume on Seismology and Geodesy, pp. 259-264. Galitzin, B (1909); "Zur Frage der Bestimmung des Azimuts der Epizentrums eines Bebens"; Assoc. Internat. de Sismologie, C. R. Zermatt, 1909, pp. ]32-141. Gutenberg, B. and Richter, C. F. (1954); "Seismicity of the Earth" 2nd Edition, Princeton Univ. Press, Princeton, N.J., p. 310. Gutenberg, B. and Richter, C. (1956); "Earthquake Magnitude, Intensity, Energy and Acceleration", 2, Bull. Seismol. Soc. Am., 46 (2), 105-143. Iida, K., D. Cox and G. Pararas-Carayannis, (1968); "Prelim. Catalogue of Tsunamis Occurring in the Pacific Ocean", Hawaii Institute of Geophysics, Univ. of Hawaii, Data Rept. No. 5. Le Pichon, X., (1968); "Sea-Floor Spreading and Continental Drift", J. Geoph. Res., Vol. 73, No. 12, June 15. Lockridge, P.A., 1985 Tsunamis in Peru-Chile, World Data Center A for Solid Earth Geophysics Report SE-39, 97 pp. Lomnitz, C., and Cabre' R. (1968); "The Peru Earthquake of October 17, 1966", Bull. Seism. Soc. Am., Vol. 58, No. 2, pp. 645-661, April. Nakano, H. (1923); "Notes on the Nature of the Forces which Give Rise to the Earthquake Motions", Central hIeteorol. Observ. Japan, Seismol. - Bull., V. pp. 92-120. Ocola, L. (1966); "Earthquake Activity of Peru", Am. Geophys. U., Geophys. Monograph 10, 509-528. Pararas-Carayannis, G. (1968); "The Tsunami of October 17, 1966 in Peru", International Tsunami Information Center Newsletter, Vol. 1, No. 1, March 5. Pararas-Carayannis, G. (1972); "The Great Alaska Earthquake of 1964 Source Mechanism of the Water Waves Produced", National Academy of Sciences - Committee on the Alaska Earthquake, Volume on Seismology and Geodesy, pp. 249-258. Pararas-Carayannis, George. An Investigation of Tsunami Source Mechanism off the Coast of Central Peru. Marine Geology, Vol. 17, pp. 235-247, Amsterdam: Elsevier Scientific Publishing Company, 1974. U. S. Coast and Geodetic Survey (l966); "Preliminary Determinations of Epicenters", #73-66, 21. Wilson, B. (1964); "Generation and Dispersion Characteristics of Tsunamis" Studies on Oceanography (Editor; K. Yoshida), lluiv. of Tokyo Press, Japan, 1964. Wilson, B. (1969); "Earthquake Occurrence and Effects in Ocean Areas", Tech. Report CR. 69.027 (for U. S. Naval Civil Engrg Lab., Port Hueneme, Cal. ), Feb., pp. 188.